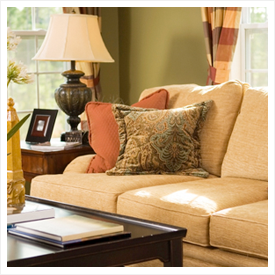 Upholstery Cleaning | Magna-Dry | Carpet Cleaning Lafayette IN | Magna-Dry IN | Call now 765-449-0422! Magna-Dry thoroughly vacuums all surfaces of the upholstery prior to cleaning. If there are removable cushions, arm covers, etc., then they are removed and each side is vacuumed so nothing gets missed. Magna-Dry cleans all upholstery by hand, making it labor intensive, but also ensuring that no harm is done to the fabric in the process. If our upholstery cleaning technicians feel that damage may result from a cleaning, they will review the reasons with you and recommend a solution.